The housing market is doomed in the U.S., and the causal factors are all well-known. But we don't want to know, because that knowledge would re-order the American culture and economy. Yesterday I suggested that what we don't want to know is as important as what we know/don't know. We know housing values are artificially and unsustainably high, but we don't want to know this. About two-thirds of U.S. households own a house (75 million); 51 million have a mortgage and 24 million own homes free and clear (no mortgage). Most of the other 36 million households are moderate/low income and have limited or no access to credit and limited or no assets. Who benefits from a housing market propped up by massive government subsidies? The homebuilders, lenders and real estate industries, of course, but the 75 million "stakeholders" in the housing market also want to believe the market is "fairly priced" and bound to recover its bubble-era heights. If we look up all the gory details in theFed Flow of Funds, we find that household real estate fell from $23 trillion in 2006 to $16.5 trillion at the end of 2009. That is a decline of $6.5 trillion, more than half the total $11 trillion lost in the credit/housing bust. That $6 trillion in wealth is gone. For many households, that was the majority of their wealth. Naturally, all of us who saw the value of our property skyrocket in the bubble years want those valuations (and all that equity/wealth) back. But it is not to be, for fundamental, undeniable reasons. 19 million in the first quarter of the year, up from 18.9 million in the fourth quarter. In the past year, the housing inventory rose by 1.14 million to 130.9 million, while occupied homes increased by 1.07 million to 111.9 million. According to Census data, perhaps 4-5 million of these are truly second/vacation homes. We can estimate that several million other houses might be located in places no one wants to live any more, or they are no longer habitable. Deduct as many millions as you plausibly can, and you still have 10+ million vacant dwellings. 104 months to clear housing inventory, shadow inventory. Basic supply and demand suggests that prices must fall as supply far exceeds demand. Since Baby Boomers will be downsizing and defaulting for years to come, the supply of homes for sale could easily expand beyond today's inventory. in Housing Headwinds and Baby Boom Demographics (April 13, 2010). As the baby Boom downsizes and defaults en masse, there aren't enough potential buyers to soak up all the suburban homes and second homes that the Boomers will be selling. 3. The entire mortgage market has been socialized by the Federal government, which is poised to lose hundreds of billions of dollars propping up the housing market. As wards of the state, Fannie and Freddie are insuring three out of every four mortgages. Most of the remaining 25 percent are being guaranteed by the F.H.A. As much as you might resent the fact that the taxpayers now have to pick up behind new Fannie and Freddie, the sad truth is that without them, no one in America would be able to buy a home. (In 2009), government-backed loans have accounted for 99%, or $1.5 trillion, of mortgage securities. Banks and other private firms have issued a mere $15 billion. In addition, the Federal Reserve and Treasury have spent nearly $1.25 trillion buying those bonds to support the housing and broader credit markets. "The government is literally plowing trillions of dollars into the U.S. mortgage market to keep it afloat," says Guy D. Cecala, publisher of Inside Mortgage Finance. Meanwhile, the costs of this unprecedented subsidy of housing may cost $1 trillion in losses on Fannie and Freddie alone. 4. The Roots of the Housing Bubble Remain Unchanged: moral hazard, unregulated risk, extreme leverage, fraud, you name it--nothing's changed. 5. Defaults and foreclosures will dump millions more homes on the market. F.H.A. commissioner, David H. Stevens, acknowledged that some 20 percent of F.H.A. 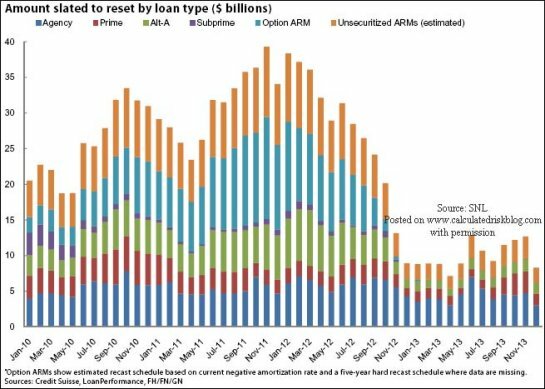 loans insured last year — and as many as 24 percent of those from 2007 — faced serious problems including foreclosure. 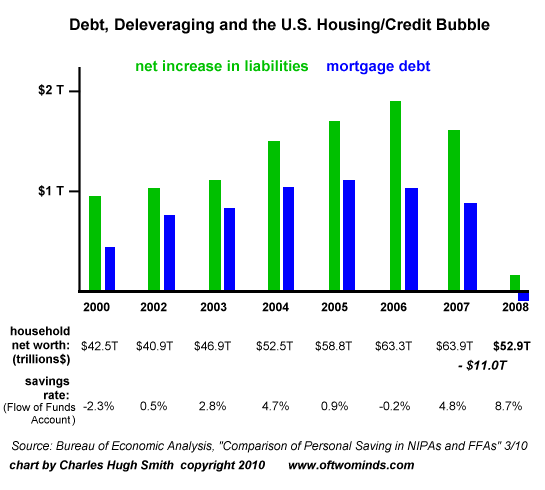 The problem with that willingness to absorb risk for the sake of incentivizing borrowing for home ownership is that next year another 20% will default, and then the following year another 20% will default, and by year Five the vast majority of those loans backed by FHA will be in default. The Federal Housing Administration (FHA) has guaranteed about 25% of all new U.S. mortgages written in 2009, up from just 2% in 2005. Thank you, Paul L. ($50), for your splendid, sustained generosity to the site -- I am greatly honored by your support and readership. Thank you, Hwan-Ching T. ($10), for your most-welcome contribution to the site -- I am greatly honored by your support and readership.